Stephen Amell has played the character of super hero Oliver Queen in the television series Arrow. This green colored leather costume is inspired by the outfit that he wears in this series. It has a full front zip and a hood attached with the neck. It has a very stylish armored vest that allows you to carry your weapons on the back in a green leather case (leather case is not included). This case remains attached with the vest with the help of black leather belts that are worn over the chest and the shoulder. This green costume has been made stylish with the help of metallic buttons placed all over the front, sides, and back. You can feel as confident as your favorite super hero wearing this leather vest during a cosplay event. I was looking for a leather vest similar to my all time favorite It is similar to arrow season 2 but I love this vest more. I like the hood, lightweight, nice color and pretty much warmth. Everything is just perfect! 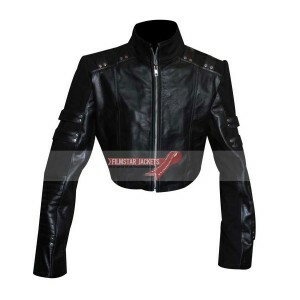 "This Harley Quinn Jacket is best purchase I have ever made; I really like the quality of the fabric and stitching as well. I believe this is what’s "
"I ordered this beauty for a party I had in my house and I must say that this vest enhanced my look like anything and everyone asked me about the place"
"The division jacket is superb no doubt about that but I aint sure about the logo on the arm. It looks slightly different from the actual one. Actually"